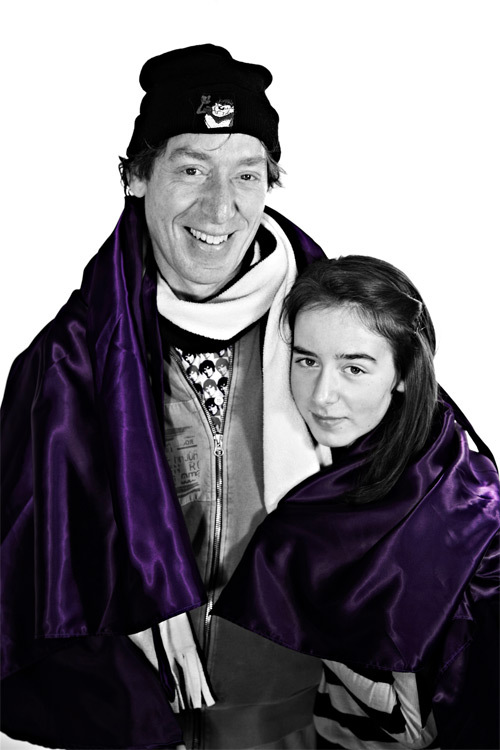 Jolly and Rosy Stanesby are an inspirational father-daughter duo who have been had to go to hell and back to keep their relationship alive. For Jolly, it meant a 9-year battle against the Family Justice system and a stint in jail, but for Rosy it was 9-years of pain, heartache and a lost childhood. "I am left with an ache within me that I cannot seem to cry away." Full text of the speech Children4Justice founder Rosy Stanesby made at the censored Shared Parenting event in the Palace of Westminster on 12th June. My parents separated in 2000 when I was 2 years old and once the courts had got involved, I was only allowed to see my Dad for four days a month. I had to wait another 6 years before I was allowed to talk to my Dad on the phone- and that was only for 10minutes on a Wednesday evening between 5.30 and 6. My own Dad. Could he not just pop round and ask me how my day was? … No… It was not his time. When I was at my mums it was like I was not his daughter anymore because he wasn’t allowed to be my Dad. It was all on paper, in writing, in court orders – my life being controlled like some kind of computer game. For years, every time I went to my Dads, my mum had to bring the police along too. He was dangerous apparently, even though I knew he wasn’t. One time when I was about 4 years old, police came round to my house at dads and tried to take me away. I was on the missing persons list whilst my mum was on holiday in America. They were treating him like he was some kind of criminal. After, my mum’s solicitor thought the police should have ‘forcibly’ removed me from my Dad’s house. I remember talking about my Dad at my mums and her crying and crying. I did not want to upset her so I tried not to speak of him. I felt I had to be careful about everything I said in case it was used to hurt either of my parents in court. There were two sides and I wanted to be on both. The courts were there, using me to destroy my parents and they did it oblivious of my feelings. I was so confused, but I couldn’t talk to anyone. Who should I believe? Should I be afraid of my Dad because my mum seems to be? Everyone seemed to be against my Dad, everyone but me. When I was younger I couldn’t sleep at my Dads without holding his thumb. I was scared people would come in the night and take me away. Even when I fell asleep, I still wouldn’t give him his thumb back- I held it tight! At primary school we were awarded merit points for doing well. We celebrated these in assembly where your parents could come and see you. For me this had to be done over two assemblies and I found this really embarrassing. I would try to make some sense of it all, and me being the only one who still loved my Dad really scared me. I knew he was not bad. Or was there something wrong with the way I felt? I would cry myself to sleep, trying desperately to fit the pieces together in my head. In an interview with two Plymouth Cafcass officers, I told them I wanted to see more of my Dad. They questioned how this would make my mum feel. This shocked me but I told them honestly that it would probably upset her. It followed by them asking me how I felt upsetting my mum. After, I was in the waiting room outside, and I could hear my mum crying in her interview next door. I immediately thought they had told her what I had said and I felt really guilty. Even after this upsetting interview, they lied in court about what I had said. Why were they ignoring me? I missed my Dad so much. When I was younger, my Dads driving licence was taken away by the CSA so my mum’s parents picked me up from Dads and drove me to school. One day, I did not want to go with them because I was sick of all the problems. Before long, the police were on the phone to my Dad wondering why I was not at school yet and this annoyed me. I had had enough and I told my Dad I was going to talk to the police. In the police station, I completely emptied my feelings out to a police officer where everything I said, she managed to twist around and always make my Dad look bad. I felt so small and humiliated and eventually, I burst into tears. “Why won’t anybody just listen to me” I cried at her. She reassured me she would get me a counsellor. She never did this. These authorities who are meant to be professionals, taught me to trust nobody. The lies they made up made life that so much harder on top of having separate parents. That alone is difficult, that alone is a child’s worst nightmare. But no, they obviously felt I deserved more punishment. For what again? What DID I do wrong? Why did the family courts turn everything into such a war? They sent my parents into a courtroom, basically to rip each other to pieces, to choose the best parent. I was caught in the middle every time and I hated this. Quite often I wanted to die. As much as I loved my brothers, my mum, my Dad, I felt like I was the one hurting them and if I wasn’t there anymore they would have no reason to go to court. I couldn’t see any other way out. I wanted to be with my Dad. I needed to be. It wasn’t a feeling I could control. He was my Dad. What was so wrong with that? I realised I could not let the sick, twisted people keep my Dad from me anymore. It was so unjust. I wasn’t going to let them ignore me anymore and I couldn’t just watch my parent’s burn in the battle either. In 2008, my Dad got sent to prison for campaigning with Fathers 4 Justice, for loving me, his own daughter. His involvement with Fathers 4 Justice caused him to do extreme things. But you have got to understand that they were in extreme circumstances and in the hell of the family courts, you are not heard unless you make it impossible to be ignored. Did they really think sending him to prison would make him give up fighting for me? This is clearly what they wanted. 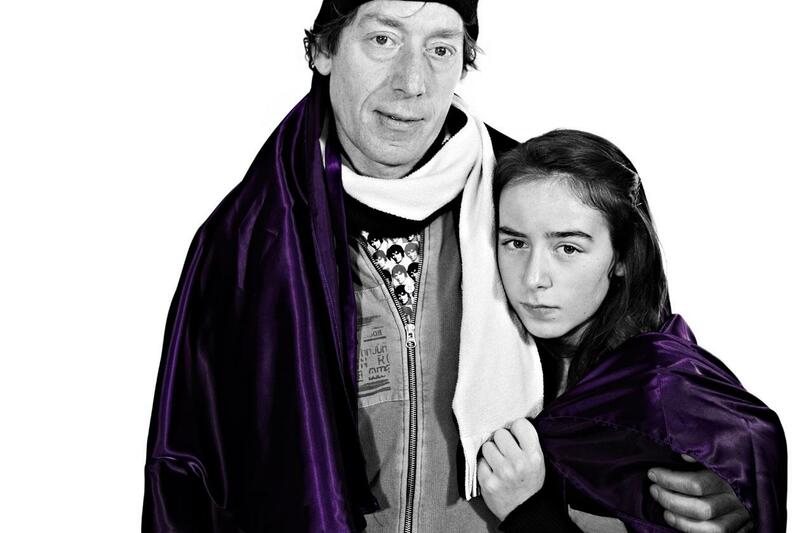 He was just a father desperate to see his daughter, not the criminal he was labelled as. But this is the sacrifice my Dad had to make, and I am so proud of him for doing this for me. If he hadn’t, I doubt we’d be together now. Whilst in prison, he missed my 10th birthday, my piano exam, and our weekends together. This broke me that little bit more, stole another bit of hope that this could all just be over. I couldn’t believe it was happening, still! But this also made me angry. How dare they deny me my father? How dare they not listen to me when they all say they work in “the child’s best interests”! Months later, another Cafcass officer came from London, to talk to me. In our interview I made sure I made my feelings extremely clear; if he didn’t listen this time, I would run away. I couldn’t take anymore of this hell I was being forced to live in. I was FINALLY granted equal residency with my Dad! I was living with him half of the time and I was so happy. It was such a relief and I was so glad it was all over. When everything began to settle down, my Dad began to get involved in my school life, we helped out more on our friend’s farm and saw our family often. I started to sleep better at night and I became more confident. Life was how it should have been, from the very start. But 9 years?! It took 9 years for me to win back my Dad. They stole 9 years from my life. After, my parents seemed to get on almost as if nothing had happened which confirmed how much of a set up the whole thing had been. The lies and other excuses had been only as a kind of ammunition to defeat my Dad and make him look bad – not fit to be my parent. Talking to my mum about this, she tells me this is what her solicitors told her to do. What a waste of time. What unnecessary pain. At home my Dad has about 3 suitcases of paperwork. Was that in the interest of me?… or were people just making money out of me? I still cry myself to sleep sometimes remembering how horrible I felt and still trying to understand everything that happened. I have so many questions to ask. 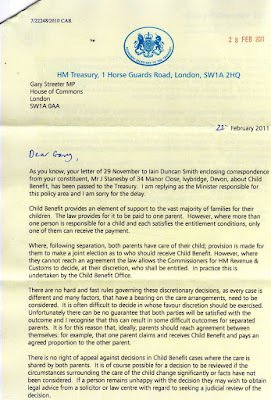 I have written to Cafcass, the Nspcc, and to judge David Tyzack but nobody cares. I have even been threatened with harassment for writing to the judge and even after all the trouble he caused my family. But in a way, I’m lucky because my Dad fought the injustice of the family courts until he was allowed to parent me like he deserved- like every loving father. But so many families aren’t so lucky. You can’t heal a broken heart. You can’t cover up the pain you go through when you’re not allowed to be with your mum or your Dad. That is why we can’t let this carry on. We have to stop it happening. They didn’t have a right to do what they did to me. I needed both of my parents. I missed my Dad so much. This is why I started Children’s For Justice and is why I’m not giving up. Shared care and shared residency works and is what every child deserves. Thank you for listening to my story. I leave my trust in you that you can help me change this. Please don’t let me down. 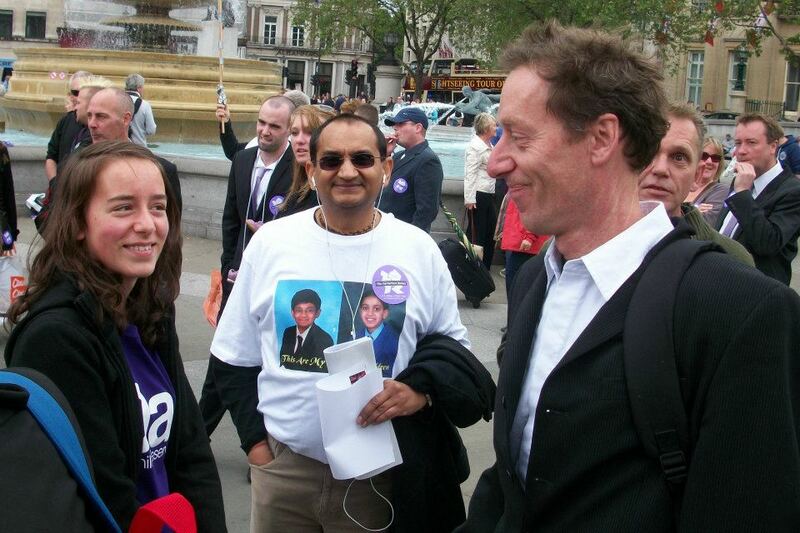 The millions of children in this country missing their mum or their Dad – don’t let them down. Children need both of their parents. Protestors marched on the home of a top judge accused of child abuse this weekend – to find him cowering behind his curtains. 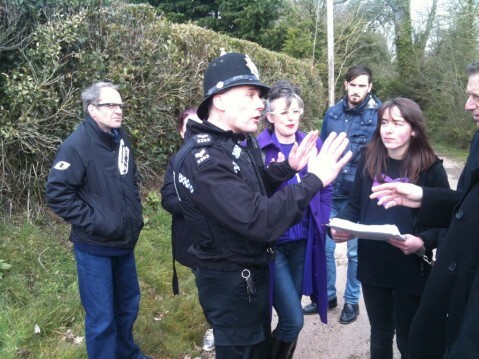 Police told campaigners who supported 14 year old ‘family court’ victim Rosy Stanesby on Saturday that Judge David Tyzack would not come out of his luxury home to explain why he ‘ruined her childhood’. Tyzack stopped Ivybridge schoolgirl Rosy from seeing her father for nine years for no reason, behind closed doors in his secret assizes at Plymouth. The traumatised youngster, who’s now 14, is demanding the judge apologise and be held publicly to account for his actions. She and her dad Jolly, a high profile civil rights campaigner, appealed for help from the public after a Devon and Cornwall police officer allegedly threatened Rosy with a ‘criminal record’ because she wrote a letter to the accused judge asking for him to say sorry. On Sunday, thanks to the rally in her support, Rosy’s letter was handed over the elderly alleged child abusers gate. A policeman and guard dog stood watch over the house as a second officer took the envelope to post through the judge’s door. Outside Rosy joined children and parents in denouncing the judge and his courts for systematic cruelty towards her and other youngsters. Standing symbolically handcuffed to her father she said; “David Tyzack tried to stop me seeing my Dad for nine years for no good reason at all. “It was a really hard time going through it all because I missed my father so much. I want some answers now. I want him to say sorry for ruining my childhood. 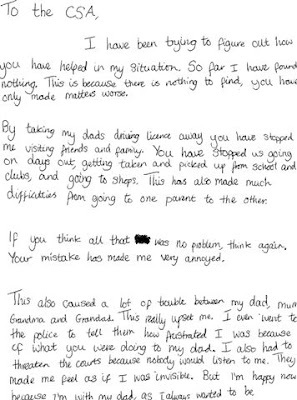 She recalled: “Since I’ve sent the judge letters, the other day the police came round knocking on my door; they claimed that they were looking for my Dad. “But I gave them his number and mine – and they never rang me. So it seems that was a complete lie. And about a week later, I was at my Dads when a policeman rang my phone. “My Dad took the call, and the policeman said it was about my writing to the Judge. He asked my Dad if he wanted ‘his daughter to get a criminal record’, and asked us to go down to the police station. Fathers for Justice founder Matt O’Connor said: “Whilst Judge David Tyzack is happy to dispense his form of justice in secret, behind closed doors, he isn’t so keen on answering to the court of public opinion. “His house, bought with the proceeds of crimes committed in the family courts, was protected by a Police van, police cars and plain clothes police officers dotted around the parameter of his property. “He was at home, but refused to accept the letter from Rosy, preferring to hide behind his curtains as he hides every day in his secret court. Anybody would think there was something he was ashamed of. “Supported by her Dad Jolly, Rosy gave a moving speech about the trauma caused to her as a result of Judge Tyzack’s decisions and attacked his cowardice for failing to apologise to her and to face his own judge and jury at his gate. “Undeterred by the lack of hospitality, in true Rogue Traders tradition, Rosy has promised to continue her pursuit of an apology from Judge Tyzack. There’s mounting pressure regionally and across Britain to abolish the so-called ‘family courts’, as overwhelming evidence of routine and widespread child abuse and human rights violations comes to light. The secret assizes still have no juries, are closed to the public, and censored to reporters, because its rogue judges refuse to obey laws passed by our democratically elected Parliament. There’s escalating pressure from the public for the undemocratic body to close for good. Victims say the courts have been a forum of systematic abuse kept from public gaze for decades, and are calling for the public prosecution of court staff by democratic jury law. Those accused include so-called ‘family lawyers’, the ‘Cafcass’ probation officers the court uses to dictate how long a child should be kept apart from their parents, and in many cases Britains’ reviled and embattled social workers . David Tyzack is under mounting local and national pressure after a series of cases he ruled over were exposed as civil rights outrages, which the judge later tried to cover up with legal threats. It’s emerged he not only effectively kidnapped Rosy from her father for nine years, but has kept a vulnerable 84 year man from seeing his beloved wife for the last three years. John Coles from Exeter has been banned from seeing his wife of 55 years Maggie ever since he complained of the alleged mistreatment of residents at her care home in the town. Tyzack has issued three annual gagging orders banning the frail OAP from speaking to anyone about what’s happened to him; Mr Coles has also been threatened with incarceration, and his home broken into by social workers, since he spoke up to criticise their system. My story by Rosy Stanesby, Aged 14. Father became an activist in Fathers4Justice. 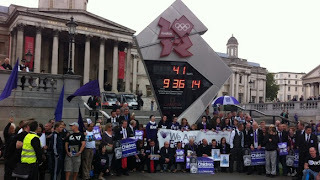 Has asked CAFCASS and the Judge for an apology and for the NSPCC to intervene. 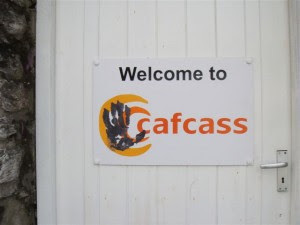 CAFCASS have issued an apology. 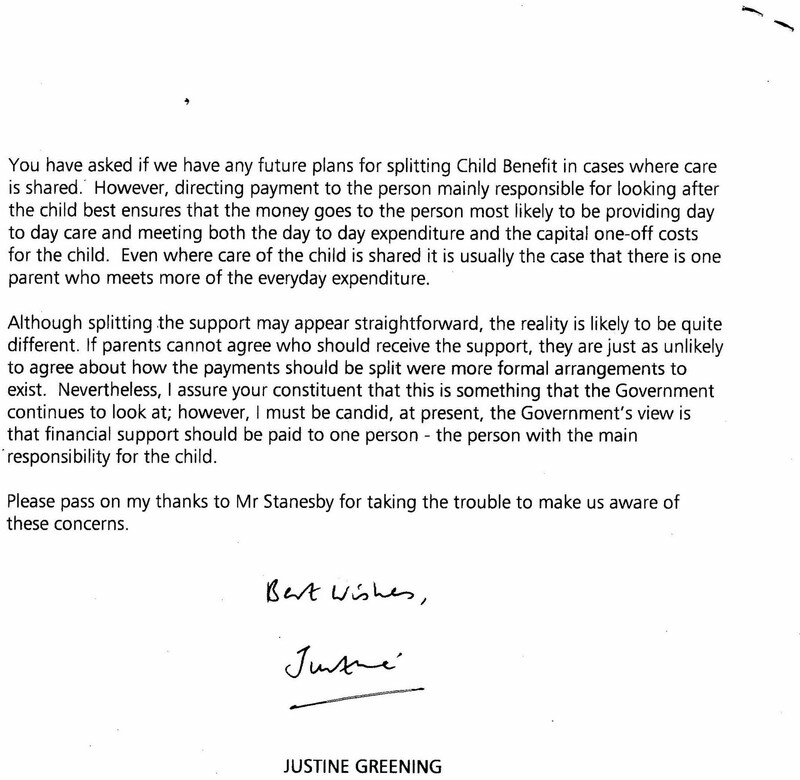 The NSPCC have refused to intervene in her case or the cases of thousands of others. In response to her apology request to Judge David Tyzack, the Police have threatened her with an harassment charge. This is the story the family courts have tried to prevent me sharing with you. I am grateful to Fathers4Justice for allowing me to share this story on their web site. My parents separated when I was two years old and for nine years, my mum, encouraged by the family courts, tried to stop me seeing my Dad. I would stay with him for four days a month and was eventually allowed 10 minutes on a Wednesday evening to talk to him over the phone. Yet my Dad had to go to court and fight to achieve this. 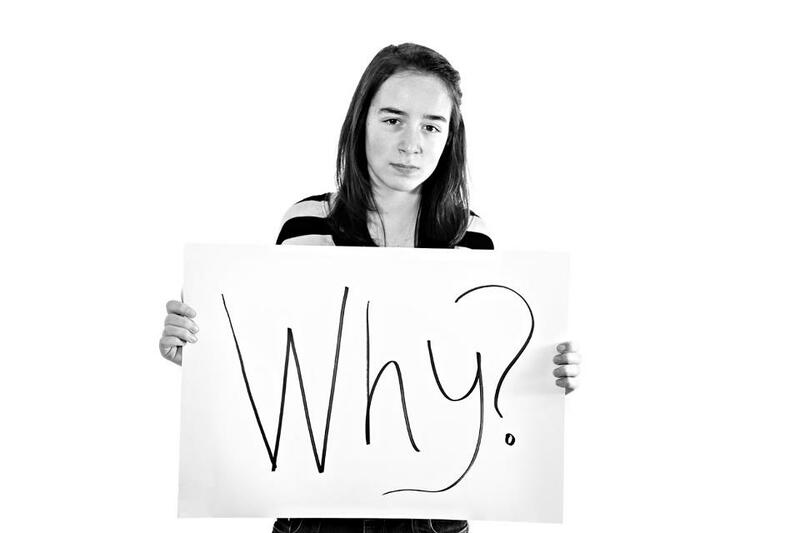 Why should my Dad have to fight to be able to speak to his daughter? I never understood why I could not be with him. I used to think that I was the problem, I had caused this hell upon my family and I would cry myself to sleep at night, missing my Dad, confused and lonely. I had no one to talk to as I was cruelly taught by the family courts, CAFCASS, police and CSA, not to trust anybody. In an interview with two Plymouth CAFCASS officers named Ms Beer and Mr Osborne, they asked me how wanting to see my Dad more, would make my mum feel. I told them that it would probably upset her. It followed by them asking me how I felt upsetting my mum. After, I was in the waiting room, colouring, and could hear my mum crying in her interview next door. I immediately thought they had told her what I had said and felt really guilty. I did not want to hurt my mum and it was wrong of them to put me in the position where I had to choose which parent to hurt. Even after this upsetting interview, they lied in court about what I had said. The police and CSA turned a knock at my front door into a stressful matter. When I was four, the police came round to my house at Dads. I was singing away, quite happily in the bath but they wanted to see me. I remember going downstairs and seeing them sat on our sofa. I now know that they were there because I was on the missing persons list due to arrangement complications and were told to take me away from my Dads. When my Dad refused this, they insisted that they had to check me for bruises or any signs of abuse. Of course, I was fine, safe and very happy to be with my Dad. Travelling from mums to Dads was made into a big drama too. My mum ‘needed’ the police every time she dropped or picked me up. At first, I thought this was hilariously funny, but I was told by my mum and others that the police were called for ‘bad people’ which confused me because I knew my Dad was not bad. I couldn’t understand why everyone was so against him. Why did my mum hate him so much? Why did she ‘need’ the police? When my Dad started protesting, the police and CSA took pictures I had drawn for him and took his drivers licence away. This made life even more difficult as my mum’s parents picked me up from Dads and drove me to school. This was very uncomfortable for me as even speaking of my Dad’s name at my mum’s house caused awkwardness and upset. On one occasion, I was about eight years old and my Grandma came to pick me up. She made a big fuss about me having a rabbit; she didn’t like it at all. This may sound small, but this really upset me and I refused to go to school with her. My Dad told her not to worry; he would get me to school somehow. Everything I said, she managed to twist around and eventually, I burst into tears in the police station. “Why will nobody listen to me?” I asked her and before we left, she promised me she would get me a counsellor to talk to. This never happened. I felt so small all of the time. I felt constantly caught in the middle and as if I had to choose a side to be on. I loved both my parents and wanted to be with them both. I was sick of the heartache and just wanted life to be over. I often thought of not being there anymore, and I saw a much happier place. I remember thinking how funny my Dad was climbing buildings. I must have been very small, but I was very proud of him. I encouraged him to wear his Robin suit because I thought the R stood for Rosy, and every time there was a protest or march, I loved the excitement and wanted to go. As I became older, I began to see the seriousness behind my Dads protests and they really troubled me. Eventually, he was sent to prison for loving and wanting to see his own daughter. He missed my tenth birthday and this upset me, but also made me more determined to be with him. Months later, a CAFCASS officer named Bob McGavin came down from London to talk to me where I made my feelings extremely clear. I could not be hurt anymore. I had to threaten to run away to make them listen to me, but it should not have taken this. I now live with my Dad half of the time and am very happy. However, my life is still shadowed by the suffering I had to go through for all those years. A lot of bad memories have stayed with me, and as much as I try, they won’t go away. Looking back, I clearly see the ugly truth behind the secret family courts and it sickens me to think of so many children going through the unnecessary pain I went through. All those years separated from their fathers, the ones they love, they will never get back. Nine years of precious time, I will never get back with my Dad either. Neither I nor my Dad deserved any of the heartbreak inflicted upon us so I have sent letters to CAFCASS and Judge David Tyzack who kept my Dad from me. I have asked them why they hurt me so much and why they are hurting others still; and I have asked for apologies. They still come up with excuses or do not even reply, and are putting me through more pain. To ad insult to injury, the Police have now threatened me with harassment after I wrote letters to the judge asking for an apology. They hit the headlines in recent years with stunts like scaling Tower Bridge dressed as Spiderman and throwing powder at Tony Blair. 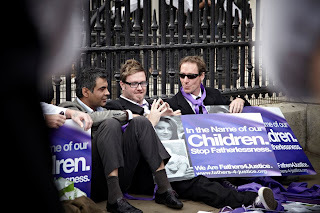 Now Fathers4Justice are threatening a new round of direct action, with London as the target. The campaigners for fathers’ rights say it’s in response to the governments proposals on shared parenting. 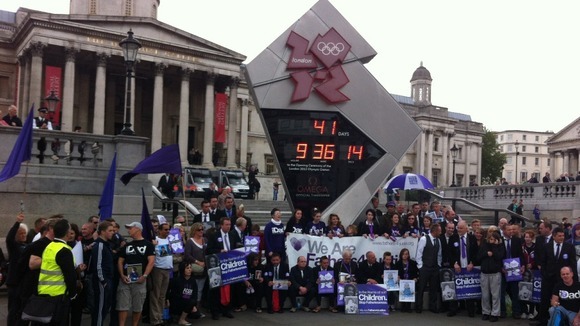 Piers Hopkirk caught up with them at a rally in Trafalgar Square. ‎"END OUR SILENCE" Five children explain in their own words how they lost their fathers (and in some cases sisters), in the family courts and why they want the law to change to give children a right to see their fathers. A founder member of the Fathers 4 Justice protest group has won an eight-year battle over access to his daughter. 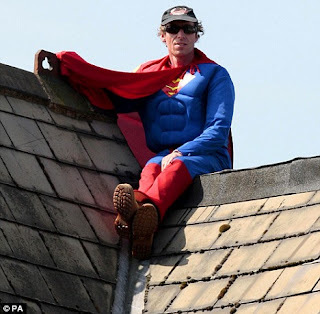 Jonathan Stanesby, 44, was jailed for two months last year for climbing on to Labour deputy leader Harriet Harman's roof dressed as a superhero. He also cuffed himself to ex-Children's Minister Margaret Hodge to protest that he could only see his daughter one weekend every two weeks. But following an agreement with his ex-partner, he has now obtained joint custody of his daughter. Stanesby said yesterday: "My daughter is now living with me half the time and she's chuffed - it's what we've always wanted. I'm obviously elated but I'm also very bitter about the whole experience. It destroys your life. I'm still paying fines, I'm still in debt, and I'll probably never be able to go back to the work I loved now that I've been to prison." The Fathers 4 Justice stunts began after Stanesby and his partner split in 2000. Stanesby, from Ivybridge, Devon, fought for shared residence and said: "I had a spacious house, I had great references, I was a registered childminder, the perfect picture of a dad. Then I went to court and I was completely and utterly humiliated. "I was so angry -I left it a week then I climbed on to the Plymouth Courts' roof. With Fathers 4 Justice, I don't want to see something I've started go to pieces so I'll continue. But my family comes first - that was always the reason in the first place." A FATHERS' rights campaigner who was jailed for his high-profile stunts has finally resolved an eight-year legal battle over access to his daughter. Jonathan 'Jolly' Stanesby has hit the headlines for handcuffing himself to MPs, scaling American monuments and ultimately serving a prison sentence in his fight for joint custody of his ten-year-old. Now, crippled by debt and "emotionally drained" from the gruelling legal process, the 39-year-old, from Ivybridge, has told The Herald his amazing story. He described himself as "elated" by this month's court result, but hit out at the "oppressive" system which he says forced him to take such drastic action through the high-profile Fathers 4 Justice campaign. Jolly said: "I've only ever asked for one thing: to be able to see my daughter. "I'm obviously elated but I'm also very bitter about the whole experience. It destroys your life. "Our system is not working, it's completely and utterly discriminatory and for me it's been a war against that bureaucracy since 2001." Earlier this month, Jolly and his ex-partner issued an agreed statement stating that they had reached a shared care arrangement agreement which had been approved by a judge. A founding member of Fathers 4 Justice, Jolly's fight for awareness has seen him climb monuments such as Stonehenge in fancy dress, sleep in cranes for a week and even handcuff himself to former children's minister Margaret Hodge. Finally, after spending 24 hours on deputy Labour leader Harriet Harman's roof last June dressed as a superhero, he was hit with a two-month prison sentence. The registered childminder, who had never been in trouble with the law until his custody battle began, ended up sharing a cell in Wormwood Scrubs with an international drug-smuggler and a man convicted of a stabbing. He said the long battle had left him cynical, untrusting and angry. "It was as though I was locked up for wanting to see my daughter," Jolly said. "She is now living with me half of the time and she's chuffed to bits – it's what we've always wanted. "But it's left me completely emotionally drained. "I'm still paying fines, I'm still in debt, I don't trust anybody and I'll probably never be able to go back to the work I loved now I've been to prison." Jolly said police had visited his house in Manor Close more than 80 times, twice raiding his home and carting away his computer to gather intelligence. He said: "Before this I had no criminal record, no involvement with the police whatsoever. But I've now been arrested and also suffered broken ribs and other injuries. "I had my driving licence taken away and police were watching me all the time. "I felt constantly targeted, like they were waiting for me to slip up. "Every time I went to London two uniformed police officers would follow me everywhere, even into the toilet. "When they raided my house they took everything, even pictures my daughter had done for me. "But they brought it all back because I had nothing to hide. "It was so emotionally crushing. "I've felt like giving up many times but you're in a situation where you can't give up – it's your child." Jolly said he had received dozens of letters of support from across the globe while in jail at Wormwood Scrubs and HMP Wandsworth, where supporters gathered outside to protest at his sentence. He also spent a night in an American cell, chained at the feet after being arrested by an armed SWAT team when he scaled the iconic Lincoln Memorial to unveil a banner in 2007. "I have feared for my life," Jolly admitted. "I was chased by the FBI when I went to New York to shut down the Brooklyn Bridge. "They think differently out there – they told me if I didn't comply they would be forced to shoot me. "They said it would make their jobs easier if myself, and another protester I was with, went with them to see the sights and went to restaurants and clubs so we did – they treated us like royalty and paid for everything. "They said we were thought to be the biggest threat to New York at that moment; we had nine men on us. "But Fathers 4 Justice has always been a non-violent organisation." The stunts began just after Jolly and his ex-partner separated in 2000, with his daughter less than two years old. He wanted greater access to his child and began the gruelling battle for shared residence. He said: "I had a spacious house, I had great references, I was a registered childminder and I'd been helping in the nursery. "I was the perfect picture of a dad. "Then I went to court for the so-called final hearing and I felt I was completely and utterly humiliated. "I was so angry – I left it a week then I climbed onto the Plymouth Courts' roof. "I was overwhelmed by the response and it just snowballed from there – I had to get the message out there. "But it wasn't really until I was in prison that I realised how much people are watching." 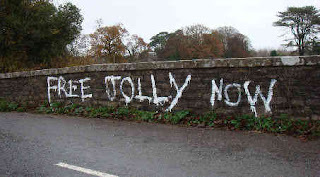 Jolly first hit the headlines when he staged a protest from the cab of a 100-foot crane in Exeter in 2003. Then he took his campaign to the capital, proceeding to scale the Royal Courts of Justice in London. He also staged a Christmas protest on Tower Bridge, took up residence on the Tamar Bridge, gatecrashed the Queen's Birthday Parade and stormed family law conferences with other activists. At the height of Father 4 Justice's notoriety, the group was even falsely accused of plotting to kidnap then-Prime Minister Tony Blair's son – an accusation that still angers Jolly. Now, despite securing shared residence of his daughter Jolly is determined to keep fighting for other fathers in the UK and beyond. He said: "It's not about what you miss out on as a parent, it's what your child misses out on. "Something like 280,000 cases went through the family courts last year and thousands more dads can't afford to take it that far. "For years they had taken men out one by one and we'd never had a voice, but we've set the wheels turning now and I don't regret a single thing, even prison. "The only thing I do regret is the fact I've had to go through it. "It seems to be guilty until proven innocent for dads in the family courts – and it really hurts. "For a father it starts with being out of the family home, then he has to apply to see his children, then the CSA starts contacting him for money and then most give up. "Then he's made financially impaired – and on top of that he's emotionally drained." Jolly said his own legal bills had run into tens of thousands of pounds, while the legal process took up so much of his time that he was forced to give up childminding and working for a local architects' firm. His finances were hit so hard he was forced to give up land near Kingsbridge where he had been rearing sheep and, eventually, he had take up Legal Aid and claim benefits. Jolly admits he found hard to cope with at times. "You are constantly depressed," he said. "It takes over your life. "In the end I couldn't work anymore and I've had counselling because I couldn't cope. "I don't want to be out of work – I want to be a childminder and even foster children. "But I couldn't give up the fight, how could a dad not want to see his daughter? "Financially, it's the days in court, it's paying for parking, it's making phone calls to the solicitors – even ink for your printer all adds up. "It can grind you down and make you give up. "I know a number of people who have had to sell their houses and move back in with their parents after spending £50-60,000 on legal fees." Half a dozen boxes packed with legal documents are testament to his eight-year battle, which has seen 23 separate agencies and hundreds of members of their staff take on the case. Jolly is convinced the system is in place to keep people in work – not to benefit the children who have to go through the struggle. He added: "Society's biggest asset is children. "But it doesn't work in the interest of the child, it works in the interest of the resident parent, which is the mother in 97 per cent of cases. "I think it's an oppressive system, but it employs a hell of a lot of people. "At the end of the day it's all about money; a broken family causes big business, whereas a happy family doesn't. "Children need stability and they need both parents in their lives. "Research has proved that children without both parents are more likely to fall into gangs, crime, drugs, everything. "One thing I found in prison was people were in there for things that mostly stemmed from family matters. "A child like my daughter, who has seen eight years of this, is bound to be affected by it forever. How can she not be?" Jolly, who reformed the group as New Fathers 4 Justice after one of its founding members left, is determined to take the campaign to other countries such as the US, where he says dads have similar difficulties. He is currently in discussions with numerous other organisations about ways to take the campaign forward. But he said that, for now, he is looking forward to finally being a dad again. He added: "When you're cut off by the courts you're cut off from their school life, their friends, everything. "I have a lot of catching up to do. 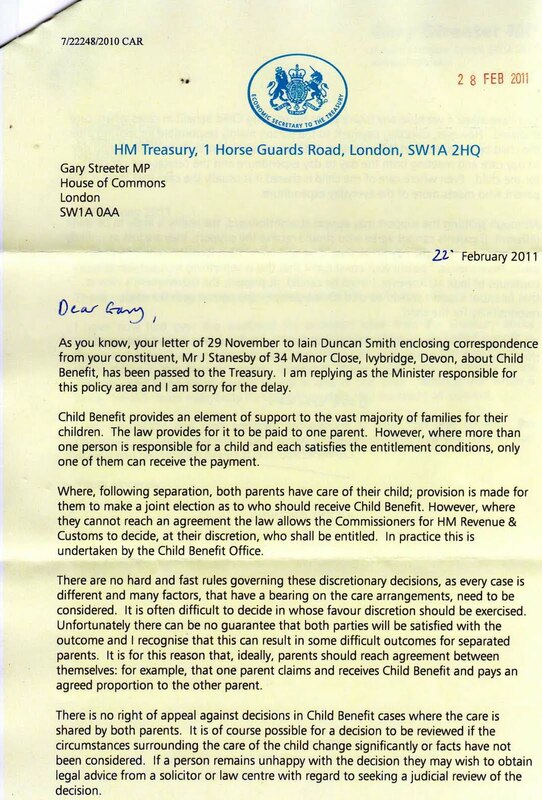 "My daughter can't wait to spend time with me, and she can't understand the system either – even at her age. "It's the little things that I'm elated about now, like I've been able to get her a phone so we can talk whenever we want. "She's very artistic, she plays the piano, does paintings and she loves animals. "With Fathers 4 Justice, I don't want to see something I've started go to pieces so for that reason I'll continue. "But my family comes first – that was always the reason in the first place." I would like to thank everyone for all their support and for all the letters, messages, and donations while I was in prison, following the roof top protest on Harriet Harman’s roof. I feel honoured at the response by everyone, including the judge who sent me down, I feel the fact they are fighting back in this manner shows we are a thorn in their side and they do not like the fact that we are exposing them for what they really are. Hundreds of Suffragettes were imprisoned before they affected change; Nelson Mandela spent 30 years behind bars with international support before that corrupt government made changes, Martin Luther King was shot dead. 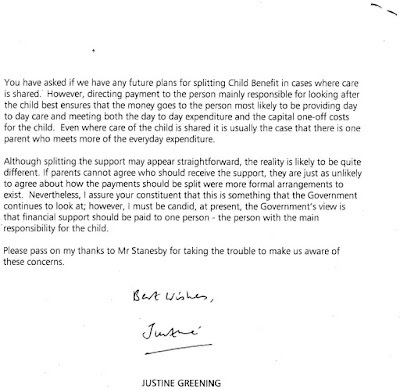 So the reality is this corrupt government will not take any notice of a few of us writing letters and moaning about the persecution and abuse of our children, and us parents fighting for the rights of our children to be allowed a balanced upbringing by both their parents after separation. The maximum sentence, for my crime of standing up against the biggest abuse of our human rights since the holocaust, was 3 months prison, with which you serve half, so that would be 6 weeks, surely that is a price anyone can pay if it will make a difference for our children. I enjoyed a good rest from the continuous bombardment of relentless, useless paperwork of, recommendations, false accusations and unfactual biased, twisted reports that comes with you wanting to be a responsible parent. It was an experience I am glad I have had, I was treated well, and if you’ve endured the family courts, it was nothing. If we want change from the disease which is family law. This epidemic of pain and suffering forced on innocent children and ourselves by untamed corruption by our government, in particular by individuals such as Harriet Harman, with her anti-men agenda, and her determination to destroy the family. If we want what is needed, radical change. Then it requires radical action, determination, effort, UNITY and some form of personal sacrifice. We are now in a stronger position than ever, with the integrity of the family court, gravy train in tatters, and two good parents clearly recognized as the most positive way forward for our children. And with a never ending collection of determined, dedicated, reliable, activists and individuals, all now that is needed is a concerted, driven effort to change things. We all have one aim, now this is the time to set aside personal differences, and keep focused and not to allow any unnecessary stumbling blocks halt our drive to succeed in what is right and just. I would like to assure all people that we respect everyone's views and understand the anxieties and frustrations that apparent inaction can cause. But many things do go on behind the scenes, and we ask for understanding, and patience as things aren’t as easy as they sometimes seem. We have no funding, and coordinating action, the costs of materials, time, transport and penalty's all come from the volunteers themselves. All donations are now accountable, and we desperately need financial help to progress things at a quicker speed. We have many activists, but there are never enough, in particular we need activists willing to endure hardship, ie a few nights out in the elements. We also want to set up a buddies scheme where individuals, volunteer to support individual activists or a parent going to court,they would be expected to appear at court, be on the end of a phone to offer help support and advice, and generally let it be realised that we work as a team and no activist should be left on there own when they have stood up for all of us. We also need back up crews in some areas, foot soldiers, willing to do the preparation on the ground, being able to keep calm, take orders and work in a team. We are updating our lists, and welcome all new volunteers, men and women to our coordinated campaign of non violent direct action.Our children depend on us and we will not let them down. This despicable corrupt injustice that we & our children are experiencing must stop ! If societies answer to a responsible parent, wanting to do the right thing for their children, is to humiliate, belittle, degrade, generally abuse & then incarcerate that parent, then I for one am not willing to accept that inhumane treatment from our oppressors, & watch while our children & fellow citizens are tormented in this way. But nothing comes for free & rarely does the oppressor give in to the oppressed without a fight, especially when they have a lot to hide. So now is the time to keep focused on these injustices thrown at us, come out of our comfort zones, stop crying in the corner & in unity take on the challenge. Our endeavors must be relentless until these career driven, spineless, vultures(Our so called superiors in law) treat us with humanity & do what is right & just, for our children & our society judge us as equals. IVYBRIDGE Fathers 4 Justice activist Jolly Stanesby was today jailed for two months for a rooftop protest at the home of Deputy Prime Minister Harriett Harman. Fellow protestor Mark Harris, of Elford Crescent in Plympton, was given a conditional discharge. Spokesman Mark Harris said: "I am shocked that Mr Stanesby has been imprisoned and know that fellow campaigners will be taking his place on Miss Harman's roof within days if not hours. The court has made a serious error in committing him to prison and in doing so incited angry dads to take further direct action." Stanesby, of Manor Close, Ivybridge, has a long history of protesting for F4J. 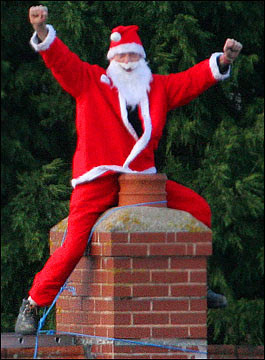 In 2003 he spent nights up a crane on the construction site of a new court building in Exeter, spent Christmas on Tower Bridge in London dressed as Father Christmas, then weeks later brought the Tamar Bridge to a standstill when he spent a week up a gantry across the A38. In February he protested at the Blackwall Tunnel in London. In May 2004 he protested on the roof of Plymouth Crown Court dressed as a superhero then in November handcuffed himself to minister Margaret Hodge. In 2006 he masterminded the storming of the live National Lottery TV show, spent two nights on a judge's roof and started 2007 by climbing Stonehenge dressed as Fred Flinstone. In August 2007 he was arrested at gunpoint by a SWAT team after climbing the Lincoln Memorial in Washington, USA. Two Fathers 4 Justie protestors have called Jack Dromey, the husband of the Deputy Leader of the Labour Party Harriet Harman, to give evidence at their trial at Camberwell Magistrates Court on Wenesday 27th August at 10.00am. The pair are also issuing a witness summons for the Minister to appear and give evidence. Jolly Stanesby and Mark Harris, both from Devon, pleaded not guilty to charges of harassment and failing to follow a police officers instructions. F4J today said that the Minister would be targeted again in the near future and that she had seriously misled the public in the media and in the House of Commons with her comments. In October 2007, Minister Margaret Hodge gave evidence against Mr Stanesby after he was accused of unlawful imprisonment after handcuffing himself to the Minister in 2004. He was found not guilty in a jury trial in Manchester. Dozens of employees were evacuated from a Bristol family court today when Fathers 4 Justice campaigners stormed the building and a fire alarm was set off.Court and construction staff huddled outside Bristol County Court, in the high-rise Greyfriars building in the city centre, and waited for the fire service to arrive. 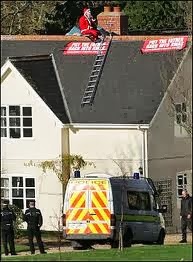 The protest, which began as a street demonstration, was joined by two Westcountry campaigners who had scaled the roof of deputy Labour leader Harriet Harman's home in Herne Hill, south London, earlier this week. Jolly Stanesby, from Ivybridge, South Devon, and Mark Harris, from Plympton, were among about 30 banner-waving protesters dressed as various superheroes during the action calling for fathers' rights at Bristol County Court yesterday. A dozen protesters dressed as Spiderman, Batman, Superman and The Incredibles forced their way into the court and chanted "What do we want? Justice. When do we want it? Now!" A fire alarm was activated, although court staff could not confirm who was responsible, and nearly 100 staff flooded into the street outside. Mr Stanesby said: "We always have a little get-together before Father's Day to put our message across." After the courts were stormed, two police vans arrived, along with two fire engines, and the protesters left the building to continue their march. 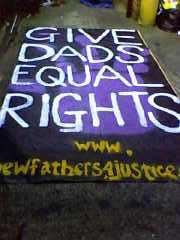 Fathers 4 Justice is a civil rights group which campaigns for parental equality and a father's right to see his children. 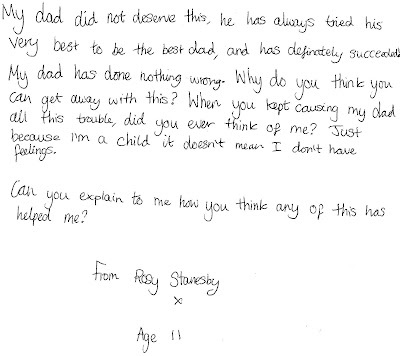 Mr Stanesby added: "Just because my ex decided to move on... shouldn't mean I don't get to see my child." He said he and Mr Harris, who have been bailed by police since their rooftop protest, had written to Ms Harman to request a meeting with her. "She's minister for justice and minister for women - how can those two things go together?" Mr Harris said opening family courts to the public was one of the focal points of the Fathers 4 Justice campaign. He said: "Open up the courts so people can see the ridiculous decisions made against fathers. I was once sent to prison for waving at my daughters." The demonstrators later unveiled a new poster campaign featuring superheroes. Bristol County Court later released a statement, saying proceedings were disrupted for around 30 minutes and business then resumed as normal.